Imagine having your very own restaurant right in your home! That's what you get with our exclusive dining program – designed to meet your needs so you can dine on the schedule that works best for you. 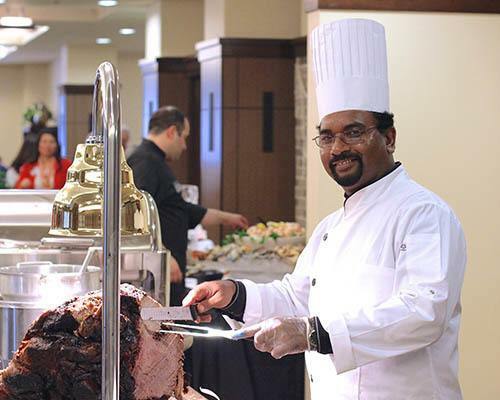 Our Executive Chefs take great pride in providing residents with healthy meals in our restaurant style dining rooms. Meals (and snacks!) are prepared to order and our dining teams work to understand each resident's preferences in order to best serve them. Click on our video to learn more about our dining program. We think Chef Barry sums up the passion that drives our dining teams each day. When it comes to one of the great comforts in life – eating – we want you to be in control. That's why at Merrill Gardens, we do things a little differently. We think more freedom around dining makes for a fuller and happier life. This is your home after all. We designed our Enjoy More Anytime Dining program so you can dine on your own schedule, whenever, and however often, it works for you. Under the direction of our very own Executive Chefs, delicious wholesome restaurant-style meals are prepared and served in our dining room by our attentive and professional culinary team. We think you’ll find our menu offers a wide variety of made-to-order choices, with new and exciting options each and every day. Food is a labor of love - I come in every day and I look at the ingredients I have and what's local and seasonal and I put it all together and sprinkle it with a lot of love. Here's how it works. It means that you can visit the dining room as often as you like, anytime you want throughout the day when the dining room is open. We always have plenty of hot entrées, soup, salad, fresh bread and desserts on the menu. Meals are prepared to order and the food is fresh all day, so you can dine on your schedule – not ours. Imagine the flexibility of having friends or family join you for a meal. Imagine being freed from the stress of missing a meal during outings or social activities. Imagine living your life on your schedule.